This recipe for Chocolate Crème Sandwiches is the first one I’m making out of Dorie Greenspan’s newest cookbook, Dorie’s Cookies with the Tuesdays with Dorie bake-along group. To me, this is like a grown-up’s version of an Oreo cookie. The cookie itself isn’t sweet, but the filling more than makes up for that! The cookie dough recipe is straight-forward and very easy to make; it’s a roll and cut-out type of cookie dough. I feel like my rolling skills should improve by the time we finish baking through this book! Dorie mentions that you should choose your cocoa carefully. I am curious to see what difference Valrhona cocoa would make compared to the brand I used. Steps 1 & 2: Mix the butter, sugar, and salt together, then add egg whites. Step 3: Add the dry ingredients all at once. I only mixed until the dough started clumping together. Step 4: Gather the dough into a ball, divide the ball in half, roll the two balls into flat discs and refrigerated them overnight. My cookie dough was nice and firm the next morning. It was the perfect time to cut out my cookies! The cookies hardly changed their shapes after they were baked in the oven. I noticed that the dough that was rolled out twice wasn’t as smooth as the dough that was only rolled out once. The differences weren’t that noticeable, though. I let all of my cookies cool while I started on the filling. The filling was extremely easy to make and came together in five minutes. All of the ingredients were whipped together in my mixer until the filling was the consistency of cream cheese. Like filling macarons, I decided to pair up my cookies based on thickness. I plopped some filling onto the bottom cookie, and then sandwiched it with the top cookie. I learned it’s not easy making cookie sandwiches look neat. These Chocolate Crème Sandwiches need to be refrigerated; if the filling isn’t firm, it’ll ooze out when you bite into them. When I took this photo, I was thinking that these would make pretty good cookies for ice cream sandwiches. If I were to make this recipe again, I would add a little more sugar into the cookies. The cocoa powder I used was a little bitter; I relied on the sweetness of the filling to counter the bitterness of the cocoa. Overall, these Chocolate Crème Sandwiches were pretty good. I really enjoyed the texture, and they were also pretty fun to make! The recipe for the Chocolate Crème Sandwiches can be found here. 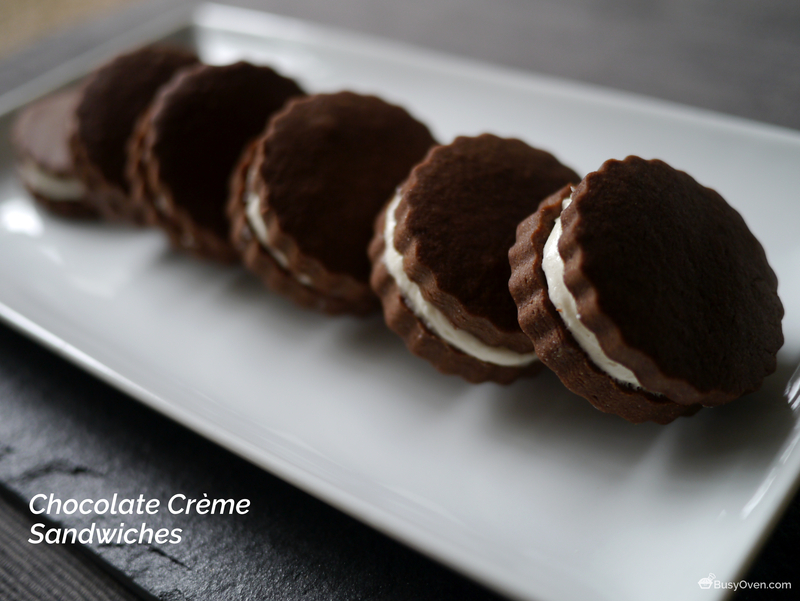 Chocolate Crème Sandwiches recipe is on page 306 of Dorie’s Cookies by Dorie Greenspan. Yours turned out so perfectly! Those look just beautiful. I love how you shaped the wafers. Your cookies look great! Thanks for the heads up on the refrigeration times and requirement. I’m looking forward to making then. Ice cream sandwiches are a great idea. I see you have made the French Snacklettes already. I agree with Katye – the photos are gorgeous! And you made your cookies look neat and professional – I had a bit of a hard time with that when I was filling them. I loved these cookies! Thanks Teresa! Filling them was pretty tricky. Towards the end, I finally got a system down: I scooped about 1 tsp of creme on the bottom cookie and bounced the back of a spoon up and down on the cream until it spread evenly, then swooped the top of the creme to flatten it a little! It sounds weird, but it works! I piped my filling in and twisted the tops on so the creme would smoosh out to the edges evenly 🙂 Like a macaron! These look great! I think that the dough looks good enough to eat without baking. I agree with you about the sugar. They were a little intense! Yours look beautiful. Beautiful photos and beautiful cookies! Just starting mine now! Thank you for the tip to put them in the fridge to firm them up once the filling is in! Thanks! These are lovely – I lost my rolling pin ring so mine were not as even as yours. I’ll definitely be making them again – so fun to make!